We provide treatment for spine disorders, such as cervical and lumbar herniation, spinal canal stenosis, and so on. We specialize in endoscopic surgeries that require a short hospital stay. A little more than 10% of all spinal endoscopic operations conducted in Japan are performed by the Iwai Group. Of these operations, about 40% of the spinal fusion surgeries performed on patients in Japan are carried out by our Group. We retain all endoscopic images taken during surgery, and provide them without editing. This is a surgical procedure to remove a disc herniation with an endoscope, and our hospital performs this operation on a large number of patients with herniated discs. The size of the wound is approximately 18 to 20 mm, and the surgery requires a hospital stay of 4 to 7 days. The costs of hospitalization and surgery are about 1 to 2 million yen. This is a surgical procedure using an endoscope with a diameter of 7 mm, which is performed on patients with a herniated disc or lumbar spinal canal stenosis. The size of the wound is just under 7 mm, and the patient can be discharged from the hospital in 1 or 2 days. The costs of hospitalization and surgery are about 1 to 2 million yen. This is a surgical procedure to widen a narrowed spinal canal with an endoscope. The size of the wound is approximately 18 to 20 mm, and the surgery requires a hospital stay of 4 to 7 days. The costs of hospitalization and surgery are about 1 to 2 million yen. This surgical procedure is indicated not only for lumbar spinal canal stenosis, but also for lumbar instability, lumbar spondylolisthesis, and so on. It is performed using an endoscope to increase and stabilize the space between the vertebrae in the spine. There will be 12 to 18 mm wounds at various sites. The surgery requires a hospital stay of 10 to 14 days, and the costs of hospitalization and surgery are approximately 2.5 to 4.5 million yen. The final decision as to whether or not you can undergo surgery or which surgery is to be performed will be made when you actually see a doctor. 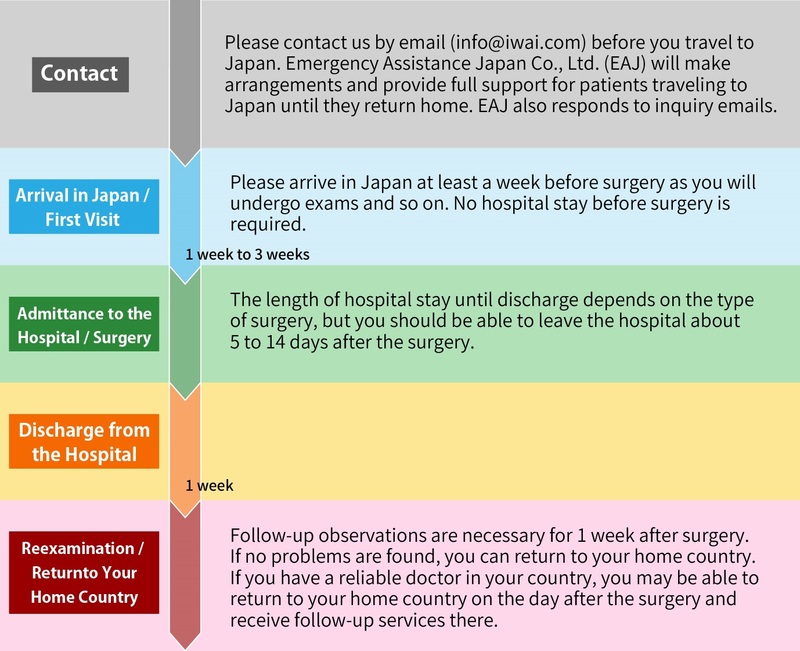 Please also note that, despite traveling to Japan and seeing a doctor, it may not be possible to perform surgery due to your physical condition. Please contact us by email info@iwai.com or the following inquiry form. If you live overseas and have questions about receiving treatment, please try to contact us by email to the greatest extent possible.